Summer is a great time to have some fun while raising academic skills/readiness by reading, reading, and reading. Here are a few ways that schools are getting students excited about summer reading. Use #ArlingtonReads to share what you are reading and to see what others are reading. Almost all schools are participating in the Arlington Public Library summer reading program. Jamestown is one school which will have tie-ins directly to the theme “Build a Better World” and the charity Unicef. Librarians from the Arlington Public Library (APL) are visiting all elementary schools to talk about the program and register them for public library cards. The APL librarians will also be visiting Arlington Community High School, Jefferson, Langston, Swanson, Wakefield, W-L and Yorktown during lunch to promote their program/sign kids up for cards, etc. In addition, the Gunston librarians are visiting feeder elementary schools to welcome the students and show them how they can access resources over the summer. ATS is asking students to participate in their annual 50 book read with lots of programming and open hours to support it. Barcroft is having their annual trip in the fall to support those who meet their reading goal. Barrett is kicking off summer with a “Bookapalooza” event and will be hosting their Friday reading events at a local housing complex. McKinley kicked off summer reading with their “Westover Library” event on June 7. Several schools provide a calendar, check-list or reading goal for the students. They then collect these forms and have a rewards program in the fall. A few schools make videos/have assemblies to promote reading over the summer. Families on board the APS Traveling Trolley. The summer, students will again take part in the Traveling Trolley. 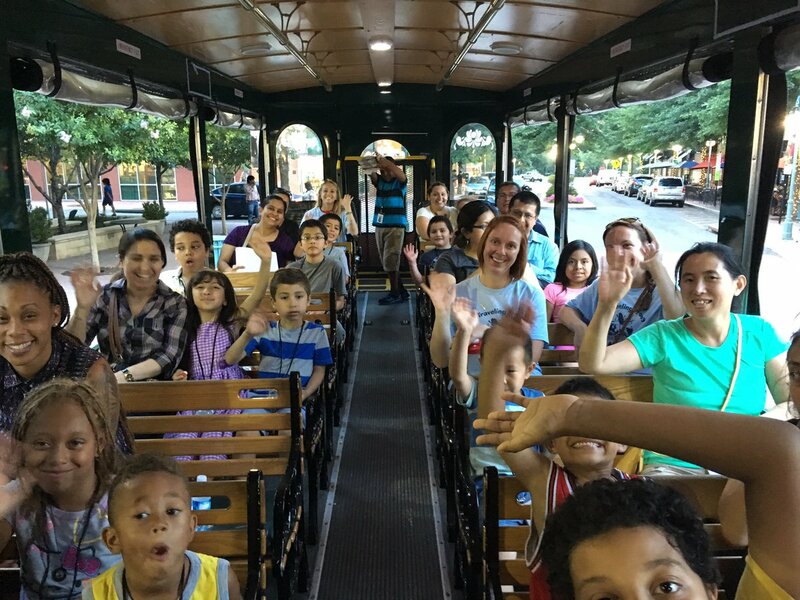 Each week in July, the Traveling Trolley will come to selected neighborhoods and take families on an incredible journey to their local public library. 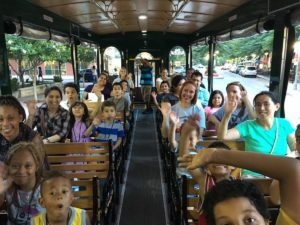 The trolley picks up families in the Barcroft, Carlin Springs, Drew and Randolph neighborhoods on July 12, 16 and 26, and August 2. A growing number of schools allow students to check out books for the summer and/or have summer hours for checkout. Some provide free books to targeted students or to students in preparation for an upcoming event (Battle of the Books and Books for the Beast). Schools providing checkout, free books, open hours or programming include: Arlington Science Focus, ATS, Ashlawn, Discovery, Glebe, H-B Woodlawn, McKinley, Nottingham, Oakridge, Randolph, Swanson, Taylor, Wakefield and Washington-Lee. Taylor will be wrapping in a STEM theme. All 13 summer school programs are staffed with certified personnel who will be assisting with summer checkouts as well. Keep a record of 3 books you read this summer and receive a free book of your choice from Barnes and Noble through the Summer Reading program. You might also enjoy these supporting activities. Approximately 650 students at APS Title I schools are receiving summer reading material in the mail this summer. Students at each school chose their books at a book fair this Spring and will receive 3 books each month in June, July, and August. Looking for some fun and low-key activities to do this summer that support literacy learning? Check out these great suggestions from Reading Is Fundamental (RIF).